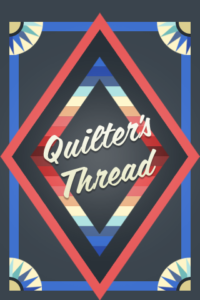 Quilter’s Thread Mobile App has a new monthly engagement pattern prize for the month that you’ll want to get your hands on. This pattern is called the Amish Four-Patch. 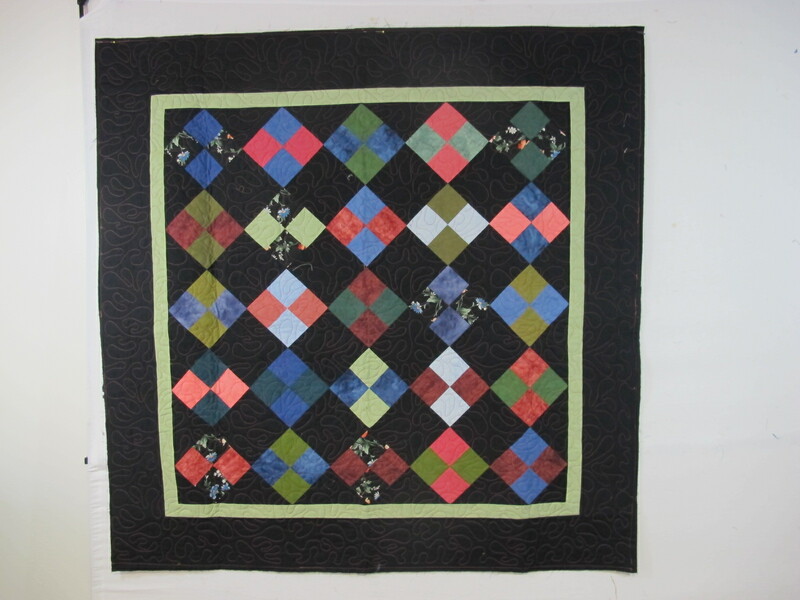 It is a traditional Amish pattern that is also done in an Amish color scheme. The pattern is originally written for baby quilts and lap quilts, and includes a tutorial on Amish color schemes which discusses how to use the Amish color choices to put visual pop in your quilt using more modern fabrics. It is quick to piece using a double four-patch technique set on point. This is a fun quilt to make. Be sure you earn the points needed to get this free pattern at the end of the month of August. Please share with us any versions of the Amish Four-Patch quilt pattern that you make on our Quilter’s Thread Mobile App. Also remember to stay active on Quilter’s Thread Mobile App in order to earn points to win a free pattern at the end of the August. Comments, uploading photos, and responding to surveys generate 1 point each. Liking 3 things on the app generates 1 point. Earn 10 points gets you a free pattern and 40 points gets you a free pattern or a Quilter’s Thread cloth shopping bag. Earn 75 points gets you a free pattern, shopping bag, and a $20 gift card. Also make sure to stop by our booth at the Wisconsin Quilt Expo. The Quilt Expo event goes from September 8th to the 10th from 9 a.m. to 5 p.m. at the Alliant Energy Center Exhibitions Hall in Madison, WI. For more information on the Wisconsin Quilt Expo click here. When your favorite quilt gets ruined or torn it can be a hard thing to get over. 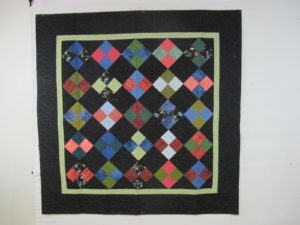 Whether it is a quilt that has been passed down by a family member or whether it was your first ever quilt made and is now starting to fall apart. Quilts no matter how hard we try to preserve them can and often do slowly start to fall apart or get damaged after years go by. However, it doesn’t mean you have to throw that beautiful quilt out. If you find that your quilt is falling apart here are some helpful tips and tricks to help you repair your quilt instead of ditching it! If you have a part in your quilt that is the main area that is damaged and is impossible to fix try to fill that area with an applique patch to cover up the damaged area. Start by assessing the area that is damaged and then measure to make sure your patch will effectively cover up the whole area and will blend well with the rest of the quilt. Take your quilt with you to your local quilt shop and ask them for advice. Also have them help you find similar fabric type and colors for the patch that will match well with the quilt. If you find that the quilt edges and or border are starting to fall apart, try making your quilt into a smaller version of itself in order to save the rest of the quilt. This is a last resort if there is no other way to save the whole quilt. You can turn your large version quilt into a table runner or a baby size quilt. By resizing your quilt you can save most of the design without having to throw the whole thing away. If the whole quilt is completely ruined sometimes the best option then is to make the same quilt pattern from scratch. By doing this it is giving you the quilt pattern that you love but a completely fresh, brand new quilt that will last longer while still giving you the design that you love so much. Share with us tips and tricks on how you have repaired a quilt on Quilter’s Thread Mobile App and make sure to stop by our booth at the Wisconsin Quilt Expo. The Quilt Expo event goes from September 8th to the 10th from 9 a.m. to 5 p.m. at the Alliant Energy Center Exhibitions Hall in Madison, WI. 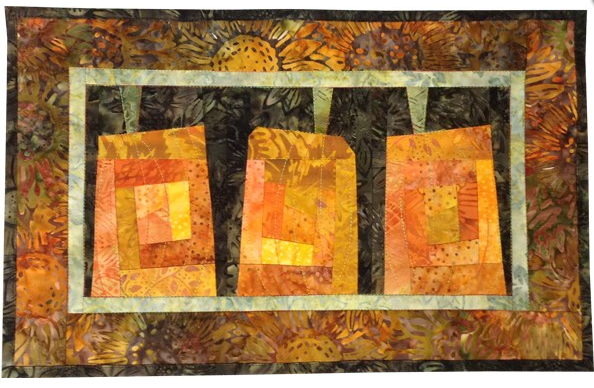 For more information on the Wisconsin Quilt Expo click here. With it now being August it is time to start brainstorming new ideas for fall and winter projects for all the festivities and holidays that are about to come. I love the summer but I also love the fall and winter because of all the festivals and holidays that bring family and friends back together again. As a quilter fall and winter seasons give us more time to stay inside and work on quilt projects. So here are some great fall and winter themed quilt projects that are trending right now. 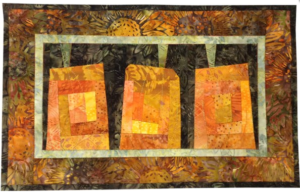 Beautiful fall colors with earth tones makes this quilt perfect for any home for decoration. 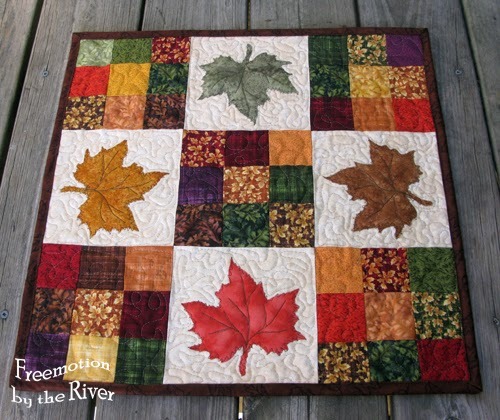 You can place this Maple Leaves Quilt Pattern in the middle of the dining room table, living room area or hang in the hall to show off to your guests when they enter your home. Pumpkin Project from Behind the Mouse the Electric Quilt Blog created by Heidi. This Pumpkin Patch Project from Behind The Mouse is another great fall season quilt project to make. Fall season is all about picking apples and carving pumpkins but why not sew a pumpkin patch that will last forever! What’s great about this pattern is that you can play with different fall color fabrics and make this pattern your own. Click here to see how different colors of fabric can change the appearance of the quilt pattern on Behind the Mouse the Electric Quilt Blog. This Sapling Mini Quilt Pattern by Laundry Basket Quilts is a great piece to make for the winter holidays. It’s simple blue and white colors make it easy to blend with any style of home and plus you can use it after Christmas into January and February. Finished quilt size is 8″ x 11″. This Very Merry Tree Skirt from B & P Boutique created by Stacey Day is a great quilt project to make for this Christmas to lie under your tree to place presents on. 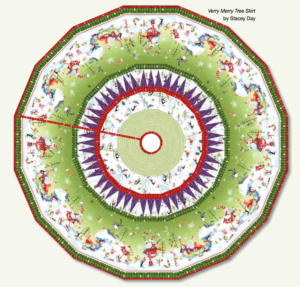 Quilt size is 48″ diameter. This quilt is made with four wedge groups to make the circled skirt. 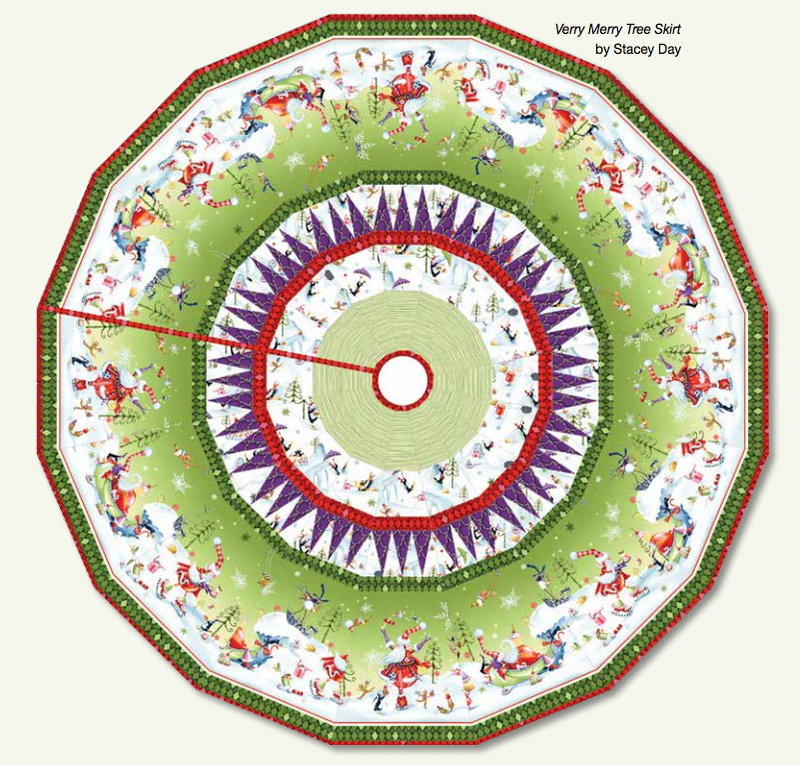 You can use the fabric recommended in the Very Merry Tree Skirt instructions or you can get creative and pick your own. 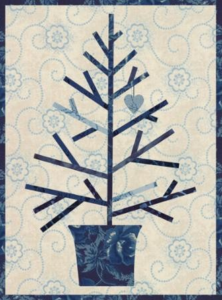 Make sure you are prepared for the holidays by getting started on your seasonal quilt projects this week. Make sure to share on Quilter’s Thread Mobile App your fall and winter quilt projects. If you are a quilter who prefers machine quilting or are a beginner with sewing machines here are five helpful tips to help make the process of machine quilting go smoothly from start to finish. Make sure to change your needles often and you’ll see all the difference! Just like a razor blade it is never good for your quilting needles to get dull. Needles are cheap to buy so you have no excuse for switching them out for new sharp ones when needed! Some people change needles every time they finish a quilt project but trust your gut and change them when you think it’s necessary. Use a Walking Foot also called an Even Feed Foot to help your fabric feed evenly on the top and the bottom while sewing. Some people use a regular presser foot but that only feeds the bottom not the top as well. This is why it is recommend you invest in a walking foot to ensure your quilt stitches are even on both the top and bottom. Try using quilt gloves for a change! They come in all different styles and sizes, so you’ll find the right pair for you easily. Quilting gloves are a great tool to use when quilting because they give you a stronger sturdy grip while holding the quilt and moving it through the machine. Plus wearing quilting gloves will help reduce the stress of quilting on your hands. Invest in a nice table for sewing. You want to make sure that where you are sewing has a sturdy and even surface with lots of room to work so you’ll never run out of space. Having lots of space will allow for you to move your quilt easily without it falling to the floor causing gravity to drag the quilt limiting your ability to move the fabric while sewing. Match the thread color for both the top and the bobbin. Sometimes you can see dots of the bobbin thread that shows through on the top of your quilt. If that’s something that will bother you then make sure to match the thread color. The thread doesn’t need to be exactly the same kind of fiber content or weight but should have the same shade of color. 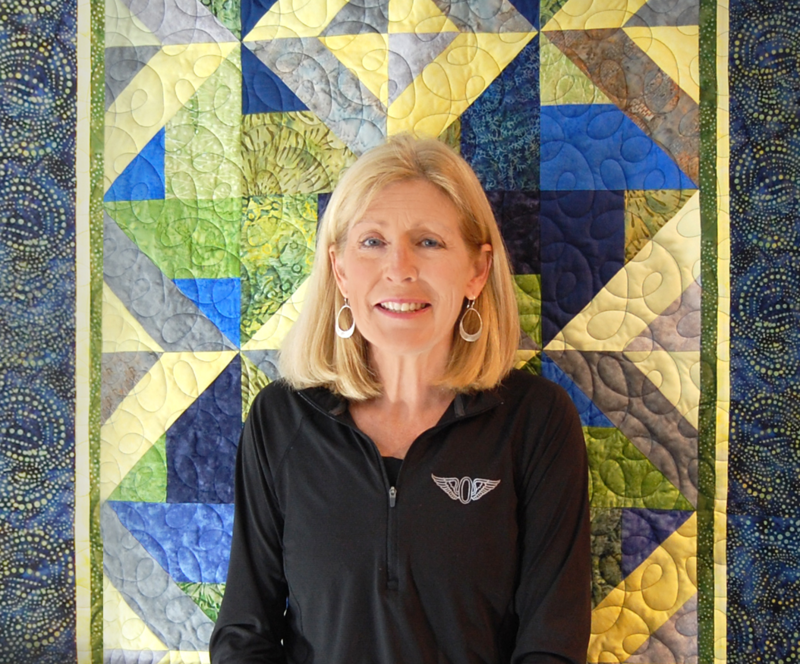 Got any favorite tips and tricks that you use for machine quilting? Make sure to share them on Quilter’s Thread Mobile App!